Heard you up to RS 55 on 26 June 2006 around 8 UTC. Tried to call you and give you report, but I'm not sure if you heard me. Running 100 W to a 5 element Yagi antenna from home. 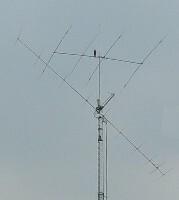 with 10 Yagi elements on 6 m.
We will start July 13 at 15 UTC and end at about July 14 at 9 UTC. looking for Japan on 6 meters. Please look for us near 50100 kHz CW +/- QRM. Copyright © JM1DTFのブログ All Rights Reserved.